Then I decided to try and make something out of my extra mirror, thinking I could paint over the mirror surface and just leave the frame brown. I taped off a border around the edge, using the line for the beveled part of the mirror. 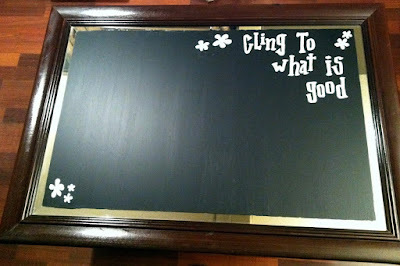 I thought it would be neat to set off the matte chalkboard finish with the shiny mirror, like a piece of matted artwork. It was a good idea in theory, but when I pulled off the tape border, a lot of the chalkboard came with it. It peeled off the mirror like a face mask, stretchy and gooey. I'm not one to give up on a project. Even when I mess up my own artwork, I always try to salvage it. In this case I touched up the jagged edges and decided to distract from the imperfections by adding some words. 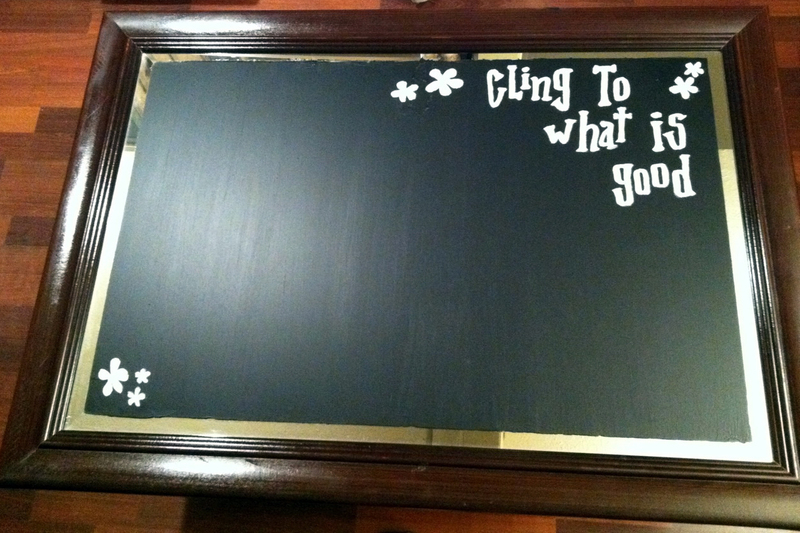 I had recently rediscovered Romans 12:9, so I decided to paint the words "Cling to what is good." Cute, right? I guess... but I wasn't going for cute. It was too cute, too girly, and just not what I wanted. 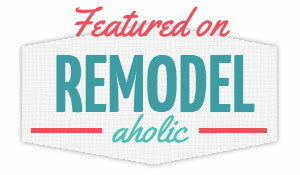 I decided to let the project sit for a day or two and see if I could come up with any remedies. The next day, I looked at it with fresh eyes and immediately decided I hated the writing. I hated the messy edges of the chalkboard paint, too, and the mirror was too shiny or something... whatever it was, I wasn't feeling it. How could I fix this? Ahh, at last– something I was happy with! Getting rid of the words took away the cutesy vibe, but the book pages added a charming, literary vibe that I like. Hubs was kind enough to hang it by the back door so we'll see it every time we leave the house. We plan to fill it with reminders, appointments, funny notes to each other– whatever we feel like! We will probably rig up a little tray at the bottom of the mirror to house the chalk, but right now we are hiding it in the top right corner. I love the chalkboard. I'm so happy that I stuck with it and finally got something that we can use. I can't wait until I have gotten rid of the red walls so that the deep brown frame and black chalkboard really pop against our white walls. The best part is that we're going to enjoy our Jamaican countdown every time we leave the house (which will only make the next five days feel even longer)! In case you are wondering, we got married five months ago but had to delay the honeymoon because my groom was busy with football season. Football is over but baseball hasn't started yet, which means now is the perfect time for some honeymooning in tropical paradise. SO. EXCITED.